I spent this week wearing some of the “big hitters” in my collection, and thoroughly enjoyed it! I began the week with Chanel No19 and Max Factor Marilyn Monroe Collection Ruby Red, and enjoyed the grown-up sophistication (something I’m sorely lacking in naturally) of bitter greenness and aldehydes. 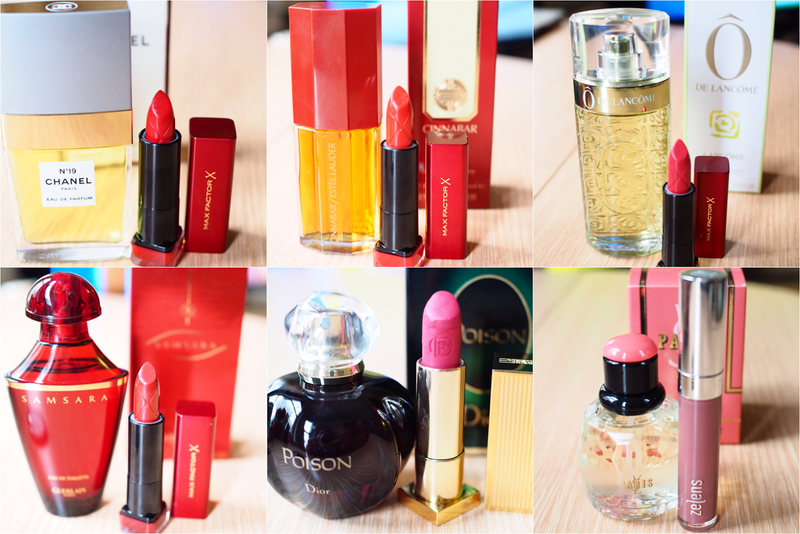 Tuesday brought brash spice and a gentle hint of the barnyard in Estee Lauder’s Cinnabar, which I paired with the (accidentally) matching Sunset Red of the same Max Factor collection (click the previous link to see what I thought of these lipsticks in full). Cinnabar is warm and full-bodied and is rather wonderful in cold weather. On Wednesday, I thought I’d wear what was the first “fine fragrance” I ever owned (at the tender age of 13! ), O’ de Lancome by Lancome. I remember it as being the lemoniest thing on the planet, and, what can I say, my memories aren’t that reliable, because it isn’t, of course, that lemony at all. Yes, there’s citrus, but there’s also a hefty punch of green herbs behind the citrus, and I loved wearing this, I kept sniffing myself in delight at such a great re-discovery. On Thursay, I wore Samsara, which was the Guerlain answer to YSL Opium (as was Cinnabar, now I come to think of it), but it has a lighter, fresher, more citrus take on the heavy spice and warm resins of the original Opium. On Friday I took advantage of the fact that my boss was “working from home” to wear Dior Poison. Well, why wouldn’t you? Applied in a small dose – no more than two sprays, maximum! – Poison is actually a lovable tuberose fragrance, with an appealingly powdery drydown. Applied with a heavier hand however, it deserves all the opprobrium it gets. It was surprisingly popular in the office, and people were amazed when I told them what it was! I wore it with Lipstick Queen Private Party, which is one of the best pinks ever. And what have you been wearing? Next Post Get Lippie at the Jasmine Awards!